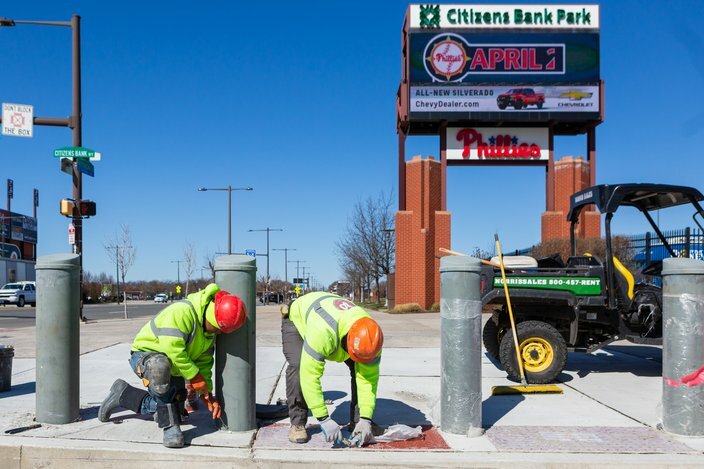 Hundreds of bollards were installed around Citizens Bank Park during the offseason. They extend below ground and are filled with concrete and rebar. It’s a season of firsts at Citizens Bank Park. Bryce Harper is starting his first season with the Philadelphia Phillies, and Citizens Bank Park is starting its season with a noticeably increased security measure. 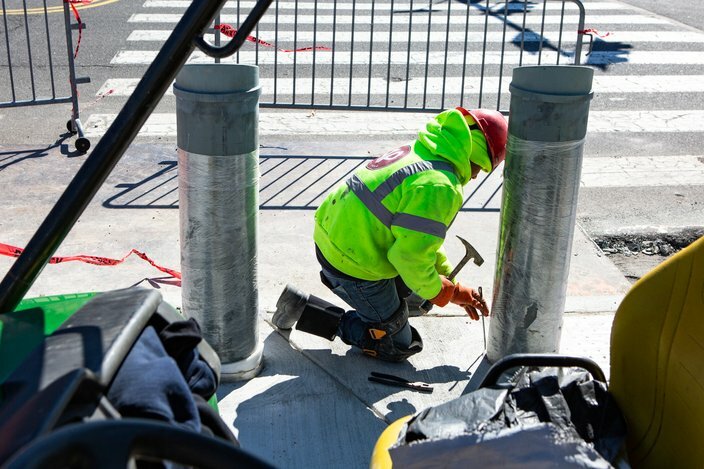 New bollards aren’t exactly what Phillies fans will head to the ballpark looking for, but they’ll be hard to miss Thursday on Opening Day against the Braves. 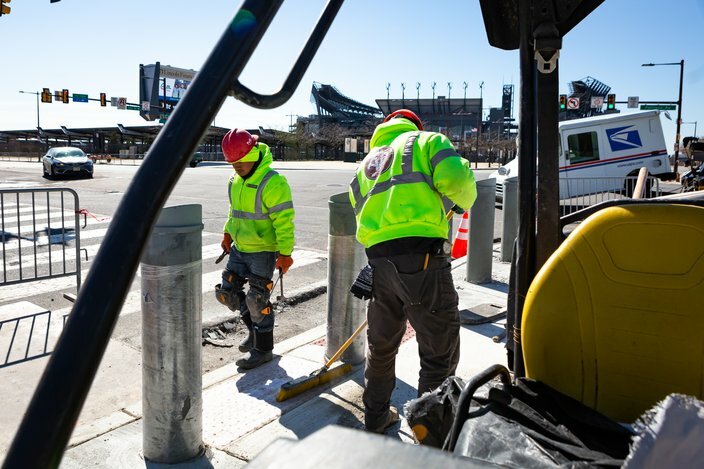 Gilberto Guzman, left, and Francisco Dejesus of AP Construction have been installing bollards around Citizens Bank Park for the past three months. The Phillies installed bollards, pillars that stand about waist-height, around the stadium's perimeter this offseason, including lining the ballpark’s idyllic Third Base Gate at the corner of South 11th Street and Pattison Avenue. The bollards are an added security measure, designed to protect against someone trying to drive a vehicle into a crowd at high speeds. The installation isn't a response to a concrete threat against the park, but rather a general response to an event the Phillies’ security team saw happening with growing regularity, according to Salvatore DeAngelis, the team’s Director of Security. “We noticed a trend in the actions of bad guys around the world,” DeAngelis said. Salvatore said he remembers one incident in particular, a 2017 attack in Manhattan on Halloween when one man in a pickup truck killed eight people and injured 11 others. The bollards in the foreground of the photo above await their required coat of burgundy paint. 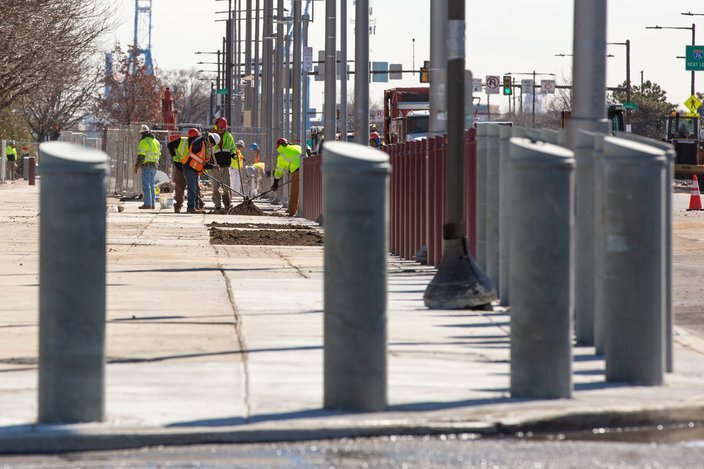 Philadelphia Mayor Jim Kenney signed the bill permitting the Phillies to install the bollards last May, and actual construction on the bollards began as soon as the team’s 2018 season ended. Just two days before the home opener, the final coats of burgundy paint were being applied as the team showed off the flashier amenities debuting at Citizens Bank Park this season. Bala Cynwyd-based LF Driscoll was the main contractor on the project, DeAngelis said, but a number of companies had a hand in the installation, including AP Construction. The bollards are pillars formed from concrete and rebar that derive their strength from the portion that extends several feet below the ground. 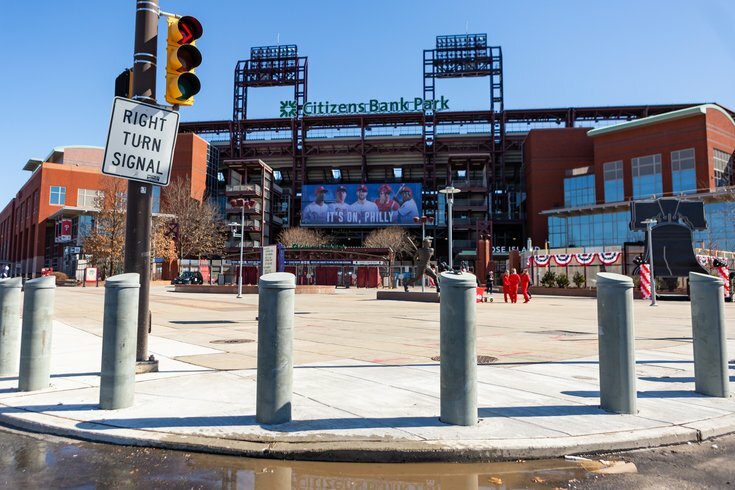 While he wouldn’t say exactly of how many have been installed around the ballpark, DeAngelis said Citizens Bank Park has “one of the most robust bollard programs in the league,” the calculation of which is one analytic Gabe Kapler’s staff will probably leave to DeAngelis. Gilberto Guzman of AP Construction works on bollard installation around Citizens Bank Park. Even with the bollards installed and the metal detectors scanning fans entering the stadium, DeAngelis said his department still will have its hands full on an average game day.